Well, did we have a winter storm or what!!! Monday started out at four below zero and cold. Tuesday came the snow storm with blizzard conditions, very windy and cold. Snowed all day, drifted and finally quit about ten p.m. Every time you’d talk to someone during the day, they’d say, “yep, still snowing.” We ended up with 28 inches of the white stuff, with lots of drifts. Kids had three days off from school while the clean-up took place. They enjoyed playing in the snow. Lots of businesses were also closed. Friday was minus one and sunny and did warm up during the day. Saturday and Sunday the Mike McDonald family enjoyed tobogganing on the hill. Took a while to make a nice path, but once they did, it went fast. Saturday and Sunday were a little better with temperatures in the 30’s and 40’s, with some snow melt. So……….are we done? I sure hope so. The robins are lost; the birds are really feeding at the feeders; the deer and turkey have a hard time getting through the snow. Monday, the 20th is the first day of Spring, so let’s get some sunshine and warmth here and get rid of this stuff. It is to warm up during the week, but don’t like what I heard for Friday. Hope it’s wrong. Joe and Diane Fanning, along with Molly, Landenberg, spent a few days at their home on Church Street. Had quite a time getting to their house, but finally managed to get shoveled and snow blown out. Molly got buried in the snow a few times. Was quite an exhausting time but still glad to be here to take care of the amount of snow they witnessed. Get well wishes to Tim Brown who had the misfortune to fall during the storm and fracture his ankle pretty badly. He was plowing, got out of the truck to do something; was going back to get in the truck, his feet went out from under him and he fell. He managed to get back in the truck and drive to the township shed; went to Sayre where he had surgery the next day. He’s all wired, plated and screwed back together but does have about eight weeks recovery time. Hope he’s well on his way. Hope to see you at the Che-Hanna R&M Club show this weekend. It’s held at the Wysox Fire Hall on Saturday from 9 a.m. to 5 p.m. and Sunday from 10 a.m. to 4 p.m. Lots of educational displays and dealers with their “wares”, along with the mini-mine for the kids and fluorescent programs by UVBOB. Civic meeting on Tuesday, April 18th, 6 p.m. at the Township Building. Thursday, April 20th, from 9 a.m. to Noon, the tax collector will be at the Township Bldg. for those of you wishing to pay your taxes. They can also be sent in the mail. Happy Birthday to Irene Risser, 28th; Heather McDonald and Trevor Kinsey, 30th. Have a nice day. Hope the flu bug has finally left and folks are feeling much better. Guess that’s it from the winter wonderland of Lopez. Enjoy your week; it has to get better. 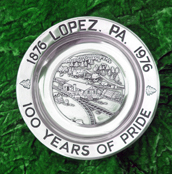 Have news call 570-928-9238; mail me; see me; or e-mail me at news@lopezpa.com. I’ll get it in for you. I’ll be here next time and thanks for reading.